Deep, Software Filter from Sinevibes. 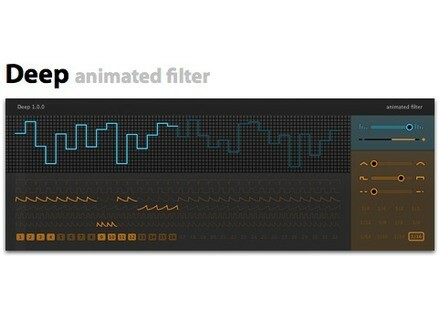 Sinevibes has released Deep, a new AudioUnit plugin for Mac OS X for creating rhythmic filter effects. Deep's envelope sequencer runs synchronized to your DAW and modulates a -48 dB/octave low-pass filter. It features various shaping and timing options. Apply filtering patterns onto instrument parts. Re-process and mangle beat loops with matched timing. Transform sounds into new material. Deep is available for $19. It can also be purchased as part of the complete Sinevibes AudioUnit pack with a 50% discount. Deep works with 32/64-bit Mac software that supports AudioUnit effect plugins and requires OS X Leopard, Snow Leopard or Lion. Full details on Deep, including audio/video examples and demo version download, are available at the Sinevibes website. Cableguys VolumeShaper 3 Cableguys has released a Public Beta version ofVolumeShaper 3 for Mac and Windows as a VST, AU or RTAS plug-in. Klanghelm Updates VUMT Klanghelm has updated VUMT, the VU meter and trim plug-in/standalone - to version 1.8.2. Rhythmic Robot Typewriter for Kontakt Rhythmic Robot has released Typewriter, a sampled instrument for Kontakt.